Defence Vision Systems has produced a series of systems using Short Wave Infra red normally referred to as SWIR. These are available in standalone items or integrated with other wavelength sensors. Defence forces around the world are in the early stages of the use of SWIR. It could be said that they are still at the stage of asking what are the advantages in comparison with visible systems or LWIR or MWIR systems. These types of questions are easy to answer as SWIR offers considerable advantages. These include the ability to see through heavy mist, light fog, natural and industrial haze and even through smoke. Many air to ground sorties are cursed with ground mist obscuring vision, however for SWIR the ground mist does not exist. In addition to these, current camouflage is visible to SWIR and ceases to be a camouflage covering. However as always it is better to use a multi waveband system to ensure the optimum viewing under adverse atmospheric or other conditions. The system displayed below incorporates a 1550nm laser range finder but alternative variants are available. These systems are designed around the use of two cameras; sCMOS working in the visible and SWIR. They share a common objective lens then the image is passed through a relay system that shares the image between the two camera types. Due to the fact that both work at different wavelengths the full signal, at the relevant wavelength, is provided to both cameras. According to use the image may be viewed on an integral screen or a remote screen. When viewed on a separate touch screen the user can select an image using an on screen slider. This slider enables the user to blend or merge the image and select either a 100% sCMOS image or a 100% SWIIR image or the fully merged image. The viewer is designed for surveillance and can be fitted with either a laser range finder or a laser spotter operating at either 1064nm or 1550nm. The incorporation of the SWIR camera means that both of these wavelengths are visible. Hence the laser spotter/illuminator may be used to mark a target or to enhance areas in shade or shadow. Using these lasers would not necessarily make the user visible as other body and/or weapon mounted night vision devices would not see the illumination or laser working at these two wavelengths. 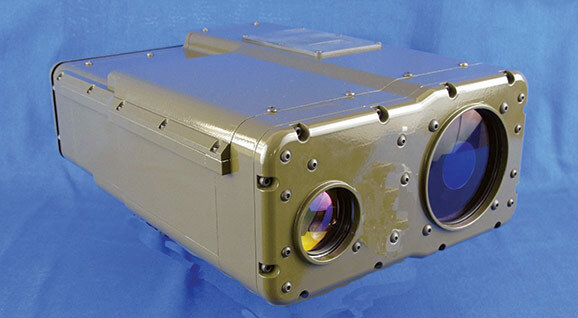 The same system mounted in a light- weight frame and incorporating a laser spotter is offered for use in air to ground applications. Due to the ability to select an image from one camera or from both, or a mix, it provides a greater ability to identify the target so reducing the time taken for such identification. In addition DVS is also developing a new armoured vehicle driving system based around SWIR cameras. The system provides a minimum of 100 degree field of view which, due to the internal camera firmware, is completely distortion free. This wide field of view could be further enhanced to 180 degrees using more cameras. However resulting from tests DVS would recommend that in the normal driving application the field of view is restricted to a maximum of 100 degrees. The output from the 100 degree system may be viewed via a head mounted screen or via a under armour screen. The use of the head mounted screen means the driver is able to use the driving system in both the head out and head down (under armour) situation. The system may be further enhanced with the incorporation of two 1550nm illuminators for us in conditions of heavy overcast cloud or thick forest canopy and shadowed ground conditions. Here again using these lasers would not make the user visible, as other body and/or weapon mounted night vision devices would not see the laser. SWIR offers a whole new experience when used for daylight surveillance. These when used with a lens specific to the wavelength are able to provide orders of magnitude increases in daylight surveillance distances as compared to standard daylight camera systems. One such system from DVS is now available for the long range daylight surveillance situation. 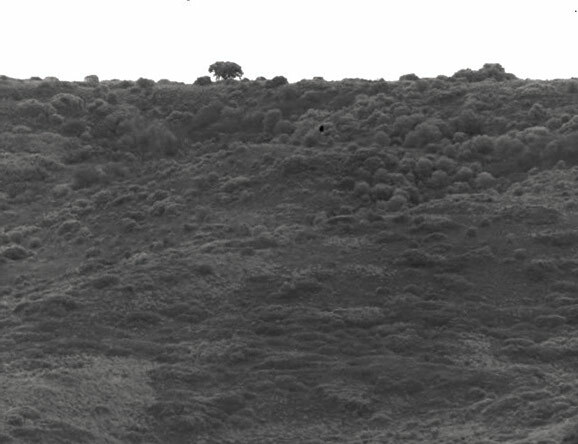 The effectiveness of this can be seen in the image of a hillside at 7Km in early morning mist conditions using such a SWIR zoom lens. DVS is continuously looking to improve the products it offers the defence market. Our development programme is continuing to develop the concept of using different wavelengths to provide wide dynamic range systems. DVS is now working on a system that has the unique feature of a single objective lens able to operate with diverse wavelength sensors, long wave infra red (LWIR), short wave infra red (SWIR) and Visible. The system will be fully integrated thus providing a small, compact lightweight unit applicable to hand held, vehicle and UAV applications. The images from this device may be viewed as individual images, one from each channel or as a merged/blended image. In the hand held version the images are viewed using an integral screen and binocular system. Alternatively the system could be tripod mounted or be mounted in a UAV. In both of these applications the images are viewed on a remote touch screen. The system enables the user to decide which image is the best for their use and can select these from three different wavelength images or he can view them as a merged/blended image.